Fish finder offers information that help modern anglers peep through what?s happening underneath the surface. 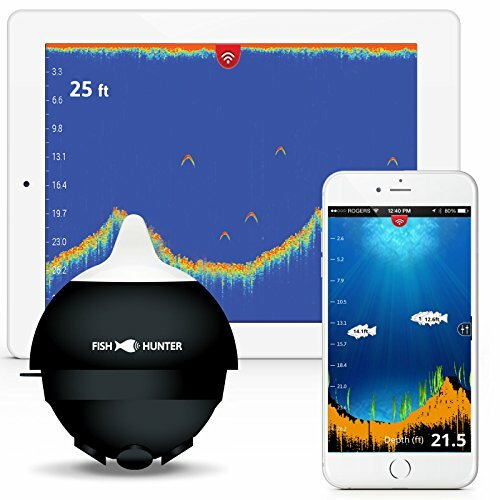 The best castable fish finder is equipped with the latest technology and features that have greatly stepped up from the old models. How Does the Fish Finder Technology Work? Without delving deeply into the technology and science of the gadget, fish ? ?finders work the same way dolphins use echolocation to navigate their way through the ocean. Using a device called a transducer; sound waves are released allowing it to travel through water. When these sound waves hit other objects underneath, it bounces back and transmits signal that is then interpreted in the depth finder?s receiver. This signal is analysed and processed using the strength of the signal as well as the amount of time it took for the sound wave to hit the object and bounce back to the receiver. With today?s technology, a small computer can determine the object?s distance thus making it a reliable and helpful tool in knowing the depth of the lake. It also serves as a guide for safety such as knowing whether there are sunken trees or shallow sandbanks to avoid. Of course there are different variations when it comes to the technology and the advantages a unit has to offer. Some fish finders are elaborate enough to send signals all over the lake. Others send limited, but equally useful sonar signals to a single direction. There are also those devices that have dual screen color, while there are others that display information and details in full color. The latest models are manufactured with many options to help anglers make the most out of their fishing expeditions. In fact, these castable fish finders are proving to be one of the new portable must-haves for both hobbyists and professional fishers. Do not confuse portable from castable fish finders because although they serve the same purpose, they vary in terms of usage and features. The primary difference, however, is on the size of the device. Portable fish finders are usually attached to the bottom of the boat or placed in the water. They have small transducer that sends signal underneath that is then interpreted and visualized in a small display screen. On the other hand, the castable units are way smaller and more rugged. The transducer is attachable to the fishing line, which you can cast to the water. This is handy as it allows you to cast anywhere you want. Each of these variations has its own advantages and disadvantages. However, a castable unit can be easily carried and used anytime, anywhere. You can use it most especially for small areas like holes where you need to investigate what?s underneath it. Bank anglers, most especially, can take advantage of the castable fish finders? features as it is not only handy, but super light and easy to bring along without adding more weight to your gears. The latest models do not feature a dedicated display so that the signal is sent directly to your smartphone through a free app. So you know castable fish finders are pretty handy. Most models in the market now offer great deals for your money. However, there are three things you need to check to make sure you are getting the right unit for your needs. You want a device that can map a lake or a pond. This feature is very handy if you are the type who likes to explore new bodies of water for fishing. In fact, some devices are so advanced; you can map an entire lake or pond system from the shore. Another cool feature about a unit ??with ? ?good GPS capabilities is that you can locate good fishing areas and find it again next time you go fishing. This means you get to save time looking for fishing spots especially those that are quite challenging to find. Range can refer to the distance you can cast and receive good signal as well as the depth a transducer can send signal and receive feedback. Most models today have impressive range for such a small device. Recent units have also transitioned from Bluetooth to WiFi since Bluetooth tend to lose connection every now and then. WiFi, on the other hand, is a more reliable and faster means of connection that allows you to cast farther than you could if your device is connected via Bluetooth. Most models with WiFi connection now allow casting as far as 160 feet in a 150 feet-deep water and 100 feet for ice fishing. Most devices instantly send feedback the moment it hits water. Some units are very sophisticated that it can tell you the depth and temperature of the water, the landscape of the bottom, and most importantly, the presence or absence of fish within or around the periphery. This means you want a device that can send clear, if not crystal clear, picture of what is happening underneath the water. Some anglers find transducers with multiple frequencies very useful. Devices with a wide frequency, 381 khz, and a narrow frequency, 675 khz, send crisp and clear picture of what you can find below. 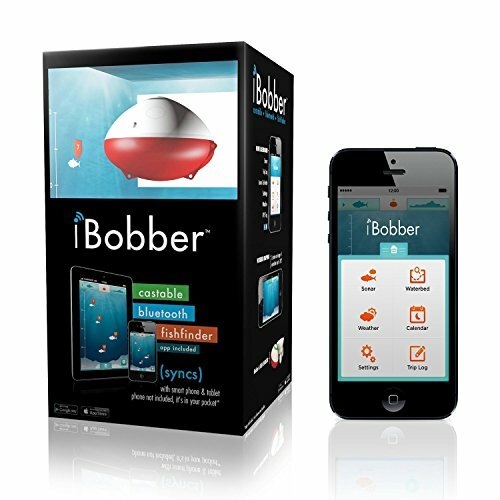 This allows you to distinguish fish from cover and other possible objects under the water. If this is not enough for you to tell fish apart from other objects underneath, some devices also allows you to use real sonar data to analyse the objects below. This is absolutely useful for ice fishing where it is hard to tell fish from other hard substances underneath the ice. As much as possible you want to invest on a device that is not only good for one type of fishing. You want to be able to use it in different modes, whether that means fishing from the shore, on the boat, or in the ice. As far as additional features go, you can rely on different companies to manufacture the latest that the technology can offer. There are devices out in the market with 5 transducers, for example, that is capable of putting out three different frequencies. Some devices also offer different modes of fishing with unique features for each mode. Some have bottom contouring mode, which is useful for seeing drop offs or cliffs. Others even have 3D mapping mode, which is pretty amazing considering castable fish finders are very tiny devices. These models allow you to see the bottom in a 3D map. Built-in GPS enables you to create bathymetric maps from the shore. Enjoy free access to Lake book, Deeper's bathymetric management platform where you can save, review and analyze all of your maps on any device from the comfort of home. Casts up to 330ft and scans down to 260ft. It operates with dual beam sonar frequency, 55° wide beam (90kHz) and 15° narrow beam (290kHz). Generates its own Wi-Fi signal to sync with your smartphone, anytime, anywhere. Pairs with the free, easy-to-use Deeper App, updated monthly. Compatible with iOS and Android devices. Made in Europe. 24/7 customer support. 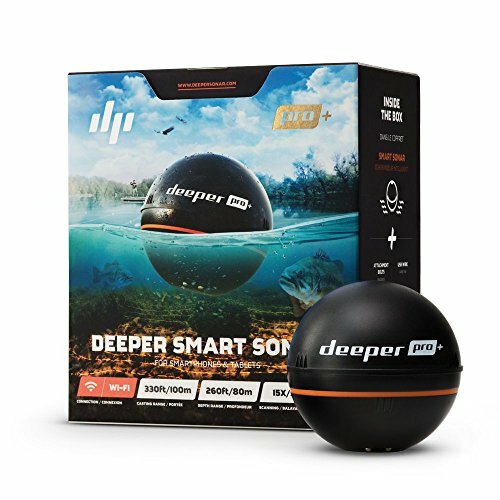 Deeper Sonar PRO+ fish finder is a sonar ball that is connected to your phone or tablet through a WiFi. This allows for longer casting and faster feedback. The moment it hits the water, this device will tell you the water?s temperature, the depth of the area, the look of the bottom, and whether there is fish around or not. It is highly versatile with different modes ? from shore, boat, or ice fishing. In terms of GPS capabilities, it has the capacity to map out the lake or river even when you are at the shore. With the device conveniently compatible with your Android or Apple smartphone, you can start navigating and investigating lakes or rivers even while on dry land. 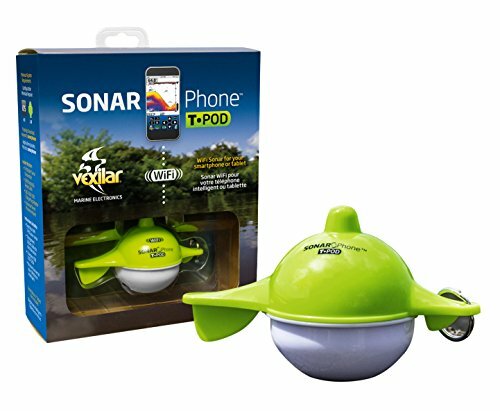 With a depth and range of 120 feet deep and 300-feet range, the Vexilar T-Pod can be easily connected to iOS and Android devices through WiFi. Multiple devices can monitor the reading from the T-Pod although it only has a single master device. This makes it a good option for group fishing or for instructional fishing options. It is also ideal for canvassing wide areas.It has a single sonar with a 30-degree beam. It also includes interesting features that include zoom bottom track, depth range (manual and auto), adjustable gain, alarm for shallow water, and most especially, fish alarm. This pocket-sized device can be easily connected to your tablet or phone with a Bluetooth connection. Some anglers also connect it with their Google watch or iWatch. The sonar gives information like water temperature, depth, drop-offs, and where the fish are located. It can be used in waters as deep as 135 feet. It can be used on the boat, paddle board, kayak, and canoe. It also has a handy feature that tells you the depth of individual fish. This allows you to cast to the right direction using the right type of lures for depth. While these fish finders aren’t cast into the water like the ones listed above, they’re a fantastic option for the angler who wants to bring a fish finder along on a trip. They make a great addition when traveling, or when fishing on a kayak, canoe, or other small personal boat. 5 powerful tri-frequency transducers (381kHz, 475kHz, 675kHz) to give you ultra high resolution and 5 times the coverage area than any other wireless portable fish finder available. The ONLY 3D wireless sonar available with 5 incredible sonar view options: bathymetric (contour) mapping, 3D fishing, 3D structure mapping, directional casting and ice fishing flasher view. Built in Wi-Fi connectivity with a range of up to 150ft and does not require cell phone tower reception. Can be cast from a boat, kayak, canoe, used from shore or trolled up to 2MPH. This powerful device has 5 transducers with triple frequency. Each three frequencies are strategically organized in a way that allows the device to show you different angles and wider viewing area. It also comes with 4 modes ? ice fishing, 3D mapping, bottom contouring, and directional casting. This unit also allows you to view all 5 sensors and informs you which of the 5 has a fish in view and what depth they are hanging out. It also has the capacity to show you a more in depth view of what is going on in each of the five sensors. This device offers a triple frequency transducer that helps you get a very clear view of what?s happening underneath the surface. This feature allows you to spot fish more efficiently and be able to distinguish it from other objects in the water. In fact, it also has a real sonar data analyser that works really well for ice fishing as well. This unit also has a great range. 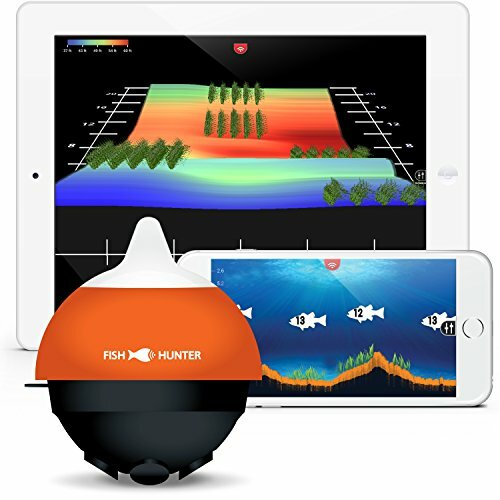 It allows you to connect the unit to your device through WiFi and cast it as far as 160 feet and let it sink 150 deep in the water or 100 feet for ice fishing. You can cast from boat to shore and troll for up to 2.5 MPH. The Verdict: Best Castable Fish Finder Goes To? All devices mentioned in this review are highly recommended. It all boils down to how much you are willing to spend for this device and what you need it for. However, if you consider the factors mentioned earlier, the device that wins this review is the Deeper Smart Sonar PRO+. Not only is this device sophisticated with all its features and technological advancements, it is also quite handy in different fishing modes and situations. You may find yourself fishing in the tropics one weekend and ice fishing in the next, and still find this device useful. Moreover, it has the GPS capabilities and the range you want in a fish finder. Fishing is fun for different reasons and having a device to help you catch fish is always a good treat. With all these advancements in technology, remember that the best way to do it is to learn responsible mode of fishing and not to abuse this new technology that helps you get as many fish as you want. If you find this post helpful, we would greatly appreciate if you share this post and also share your thoughts, experiences, and personal reviews on the comment section below.